The home of the Traditional Cumberland Sausage!! 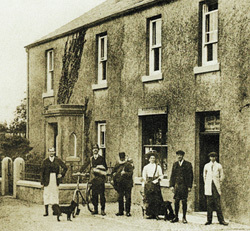 The Woodall family have been producing Hams, Bacon and Sausages for eight generations in Waberthwaite, Cumbria. Since changing the Company name to R B Woodall (Waberthwaite) Ltd in January 2011 the family continues to operate from the famous shop, which doubles up with the Post Office, producing a fine range of Hams, Bacon and Traditional Cumberland Sausage. We supply to Hotels, Guest Houses and Retail Outlets along the Cumbrian coast and within the Lake District and South Cumbria, deliveries serviced by our own transport. We also offer a mail order service on a regional basis details available upon request. Experience the unique taste of Cumbria from RB Woodall.